According to the CMIP5 design, BCC_CSM1.1 runs most of the experiments, BCC_CSM1.1(m) runs some core simulations. The output includes averages over a range of time scales, from hours to a full year, of important physical, chemical, and biological values from the atmosphere, ocean, land, and sea-ice components of BCC_CSM1.1 and BCC_CSM1.1(m). All CMIP5 data from BCC_CSM have been published on PCMDI gateway and released. The data user also can access all of the data directly on our datanode. Experiments design: A detailed description of the experiment design is provided by: Taylor et al (2009), "A Summary of the CMIP5 Experiment Design"
Resolution: T42 in atm. 1/3~1ºlat. x 1ºlon. tripolar grids in ocn. Comment: Imposes non-evolving pre-industrial conditions. Global Annual Mean precipitation historical.. Resolution: T106 in atm. 1/3~1ºlat. x 1ºlon. tripolar grids in ocn. Comment: Imposes non-evolving pre-industrial conditions. The main difference between BCC-CSM1-1-M and BCC-CSM1-1 is their horizontal resolutions of the atmospheric component and the corresponding mask of sea-land. Comment: Impose changing conditions consistent with observations.RCP8.5 scenario forcing data are used beyond year 2005. Comment: Impose changing conditions consistent with observations.RCP8.5 scenario forcing data are used beyond year 2005.The main difference between BCC-CSM1-1-M and BCC-CSM1-1 is their horizontal resolutions of the atmospheric component and the corresponding mask of sea-land. Comment: CO2 emissions from fossil fuels and land-use change are used to replace prescribed CO2 concentration. RCP8.5 scenario forcing data are used beyond year 2005. Comment: Historical simulation but with natural forcing only. 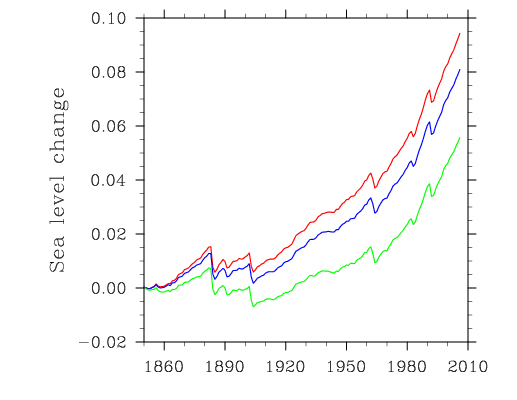 RCP8.5 greenhouse gas forcing data are used beyond year 2005. Comment: CO2 concentration is prescribed by increasing at 1%/yr from the value used in the pre-industrial control run to quadrupling . Other forcings are fixed at the values of pre-industrial control run. Comment: Impose an instantaneous quadrupling of CO2, then hold fixed. Other forcings are fixed at the values of pre-industrial control run. Comment: CO2 concentration is prescribed by increasing at 1%/yr from the value used in the pre-industrial control run to quadrupling. Other forcings are fixed at the values of pre-industrial control run. The radiation code is fed the time-invariant CO2 concentration from the control. The carbon cycle in ocean and land responds only to the increase in CO2 concentration. Comment: CO2 concentration in the atmosphere is prescribed as historical expt.3.2 during 1850-2005 and RCP4.5 during 2006-2099. Other forcings are fixed at the values of pre-industrial control run. The radiation code is fed the time-invariant CO2 concentration from the control. The carbon cycle in ocean and land responds only to the increase in CO2 concentration. Comment: CO2 concentration is prescribed by increasing at 1%/yr from the value used in the pre-industrial control run to quadrupling. Other forcings are fixed at the values of pre-industrial control run. Only the radiation code “sees” the rising atmospheric CO2 concentration. The carbon cycle “sees” the pre-industrial control atmospheric CO2 concentration. Comment: CO2 concentration in the atmosphere is prescribed as historical expt.3.2 during 1850-2005 and RCP4.5 during 2006-2100. Other forcings are fixed at the values of pre-industrial control run. Only the radiation code “sees” the rising atmospheric CO2 concentration. The carbon cycle “sees” the pre-industrial control atmospheric CO2 concentration. Comment: Future projection (2006-2099) forced with prescribed concentration scenario of RCP4.5. Comment: Future projection (2006-2099) forced with prescribed concentration scenario of RCP4.5.The main difference between BCC-CSM1-1-M and BCC-CSM1-1 is their horizontal resolutions of the atmospheric component and the corresponding mask of sea-land. Comment: Future projection (2006-2099) forced with prescribed concentration scenario of RCP8.5. Comment: Future projection (2006-2099) forced with prescribed concentration scenario of RCP2.6. Comment: Future projection (2006-2099) forced with prescribed concentration scenario of RCP6.0. Comment: Future projection (2006-2099) forced with prescribed concentration scenario of RCP8.5. CO2 emissions from fossil fuels and land-use change are used to replace prescribed CO2 concentration. Comment: Extension of RCP4.5 through year 2300. Comment: Extension of RCP8.5 through year 2300. Comment: Extension of RCP2.6 through year 2300. Years: 30 years for every five years initialized from 1960 till 2005, 10 years initialized in other years. Ensemble member: 4 for every five years initialized from 1960 till 2005, 3 for initialized in other years. Initialization: Ocean initial condition is derived from a 50-year control run under the climate condition of 1958A.D. (3.2). 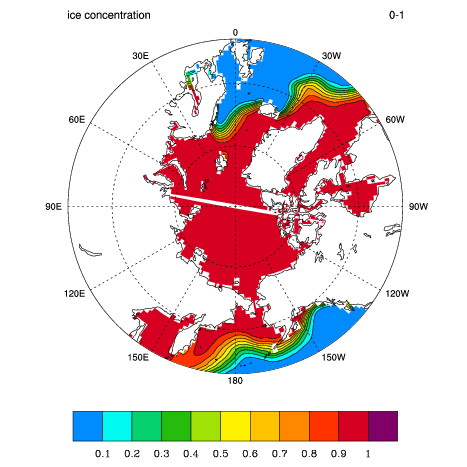 In the 50-year run, the model state is dynamic nudging to the observed SODA data of 1958 with fixed .atmospheric forcing agents at 1958, and then integrates into the predict initial time with time-evolution observed SODA data and atmospheric forcing data. Comment: The experiment starts from historical run at 1st Sep. 1st Nov. 1st Dec., XXXX year and 1st Jan XXXX+1 year for realization 1 to 4. 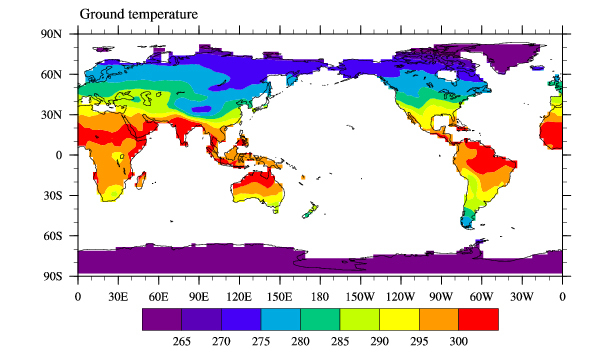 With ocean initial conditions using the nudging method to observed temperature for the start time. The atmospheric and land compositions are prescribed as in the historical run (expt. 3.2) and the RCP4.5 scenario (expt. 4.1) beyond year 2005. Initialization: The same as expt.1.1. Comment: Additional runs initialized near end of 1960, 1975, 1980, 1985 and 1990 as in expt.1.1, but without volcanic eruptions. Comment: Initialized near end of 2005 as in expt.1.1, but with a Pinatubo-like eruption imposed in 2010. Comment: Impose changing conditions consistent with observations.RCP8.5 scenario forcing data are used beyond year 2005. The initial status is from year 30 of a control run under the observed forcing at 1979. Comment: An atmosphere-only run driven by prescribed climatological SSTs & sea ice concentration from the pre-industrial control run (expt. 3.1). Comment: As in expt. 6.2a above, but with atmospheric CO2 concentration quadrupled, relative to pre-industrial level. Comment: As in expt. 6.2a above, but with aerosols consistent with conditions in year 2000 of the historical run (expt.3.2). Comment: As in expt. 6.2a above, but with sulfate aerosols consistent with conditions in year 2000 of the historical run (expt.3.2). Comment: Consistent with CFMIP requirements, the AMIP conditions are imposed (expt. 3.3), but the radiation code sees quadrupled CO2, relative to AMIP. Comment: Consistent with CFMIP requirements, add a patterned SST perturbation to the AMIP SSTs of expt. 3.3. Comment: Consistent with CFMIP requirements, add a uniform +4K SST to the AMIP SSTs of expt. 3.3. Comment: Consistent with PMIP3 specifications, impose Mid-Holocene conditions, including orbital parameters and atmospheric concentrations of well-mixed greenhouse gases. Comment: This is the BCC past1000 experiment, covering the period from 850 to 1850A.D.. Used forcings are list as follows: (1) Volcanic Aerosols: 850-2000A.D. monthly, latitudinally, and height dependent stratospheric loading of the Gao-Robock-Ammann data set; (2) Solar irradiance: 850-1849 CE. solar irradiance reconstruction from Vieira, Krivova and Solanki (VK); (3) Trace gases: The evolution of CO2, CH4, N2O over the past 2 millennia table provided by FortunatJoos; (4) Orbital parameters: The precomputed table supplied by Gavin Schmidt; (5) The values of ozone, aerosols, vegetation, ice sheets, topography and coastlines are the same as in piControl. The experiment is consistent with PMIP3, imposing forcing for 850-1850. Check the PMIP3 website for details about the experimental design https://pmip3.lsce.ipsl.fr/p3_c5_design. Wu Tongwen, Weiping Li, Jinjun Ji, Xiaoge Xin, Laurent Li, Zaizhi Wang, Yanwu Zhang, Jianglong Li, Fang Zhang, Min Wei, Xueli Shi, Fanghua Wu, Li Zhang, Min Chu, Weihua Jie, Yiming Liu, Fang Wang, Xiangwen Liu, Qiaoping Li, Min Dong, Qianxia Liu, Jie Zhang, 2012: Global carbon budgets simulated by the Beijing Climate Center Climate System Model for the last century. Submitted to Journal of Climate. Xin Xiaoge, Zhang Li, Zhang Jie, Tongwen Wu, Fang Yongjie. 2012. Climate change projections over East Asia with BCC-CSM1.1 under RCP Scenarios. Asian-Pacific Journal of Atmospheric Sciences, submitted. Xiao Chuliang, Yaocun Zhang, 2012: The East Asian upper-level jet streams and associated transient eddy activities simulated by a climate system model BCC_CSM1.1, ACTA METEOROLOGICA SINICA (English version), in press. (Abstract).